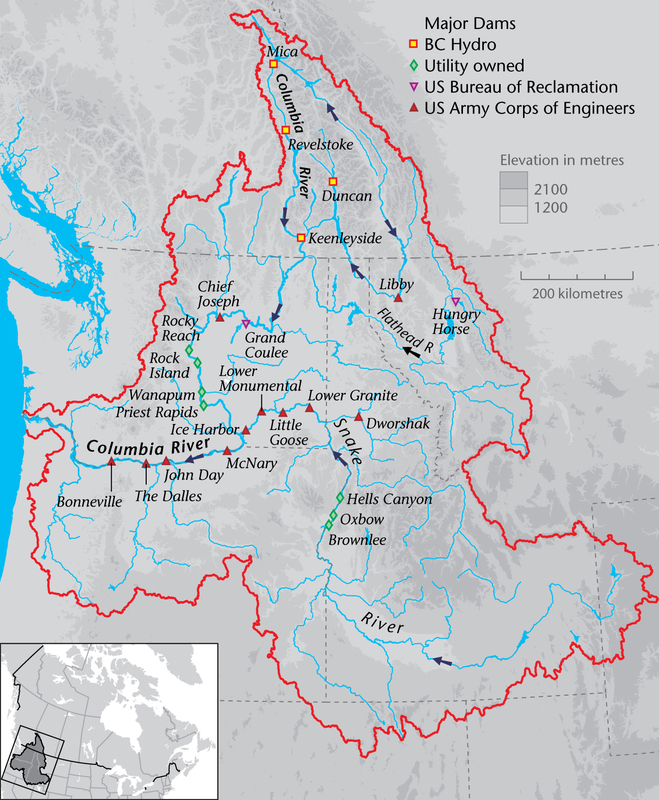 The Canada-US border offers a leading example of transboundary water governance. These two countries have worked together for more than one hundred years — through changing economic and social climates — to co-manage shared resources. With more than 8,800 kilometres (5,468 miles) of shared borders (including 2,475 kilometres (1,537 miles) with Alaska), and huge bodies of water to co-manage (from the Great Lakes to hundreds of rivers and streams that flow across and between the border), considerable scope exists for potential competition and conflict, exacerbated by growing population and increased demands for water use over the course of the 20th century. Yet, despite sustained engagement in the governance process, ”hotspots“ or ”flashpoints“ still exist. These briefs explore the reasons for these flashpoints, discuss current approaches to address issues of shared concern, and show the value of continued engagement in the governance process. Each brief is organized into three main sections: Background and Context, Challenges and Opportunities, and Recommendations. The Columbia is one of the great rivers of North America — and the continent’s fourth largest, behind only the Mississippi, St. Lawrence, and Mackenzie rivers. Beginning at Columbia Lake in British Columbia (BC), the main branch of the river travels nearly 2,000 kilometres (1,200 miles) and through fourteen dams before reaching the Pacific Ocean. 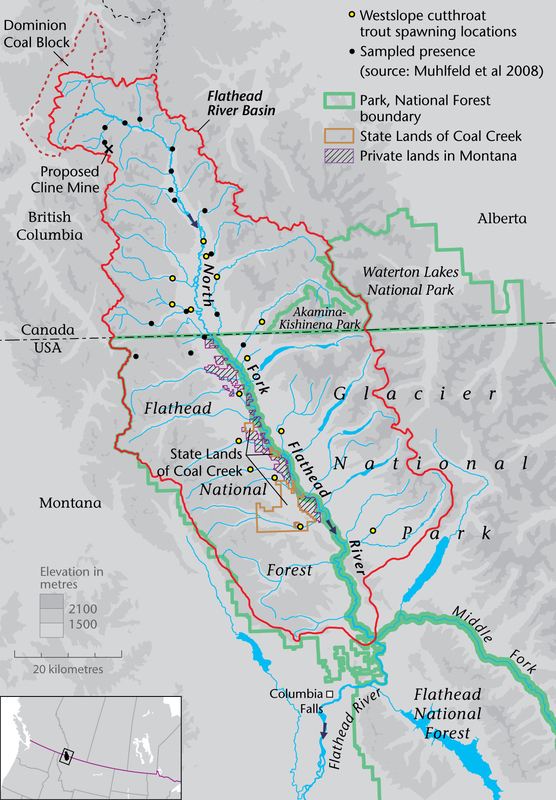 The Flathead originates in the Canadian Rockies in the southeast corner of British Columbia and flows south into Montana. The river defines the western boundary of Waterton Lakes National Park in Canada and Glacier National Park in the US. These parks were designated the world’s first International Peace Park in 1932 and became a World Heritage site under the World Heritage Convention in 1995. 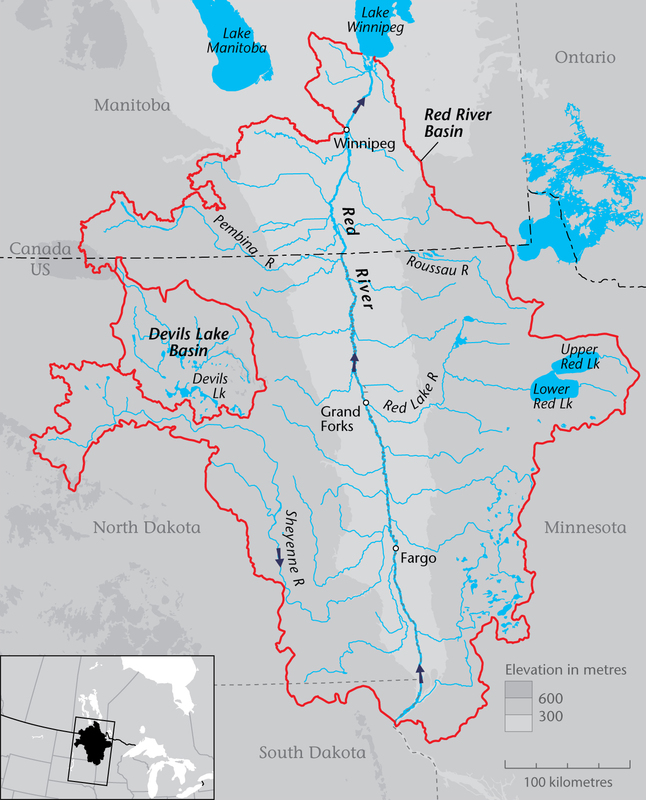 The St. Mary and Milk Rivers originate in northern Montana and flow into southern parts of Alberta and Saskatchewan. 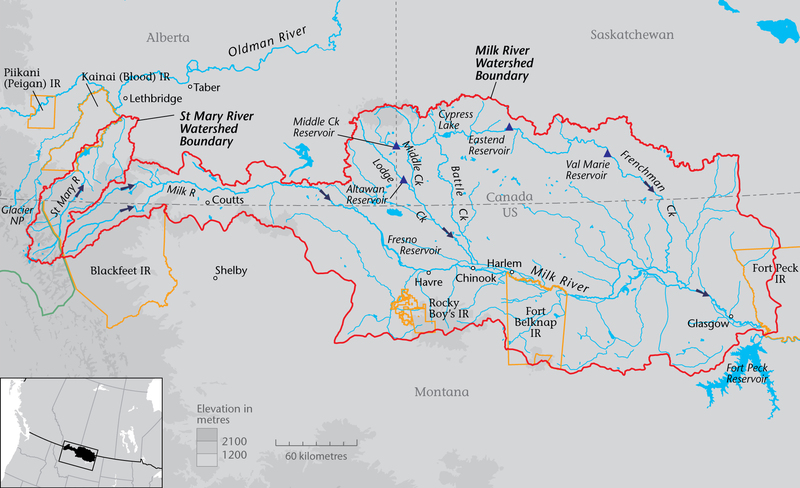 Flows in the St. Mary River are five times larger and much more reliable than flows in the Milk River. In the late 1800s, Canadian settlers began using the St. Mary River as an irrigation source; American settlers began using the Milk River. Located in the Red River Basin of northeastern North Dakota, Devils Lake is the largest lake in the state. Due to its lack of natural outflow, the lake’s water levels rise and fall dramatically, leading to cyclical periods of flooding. 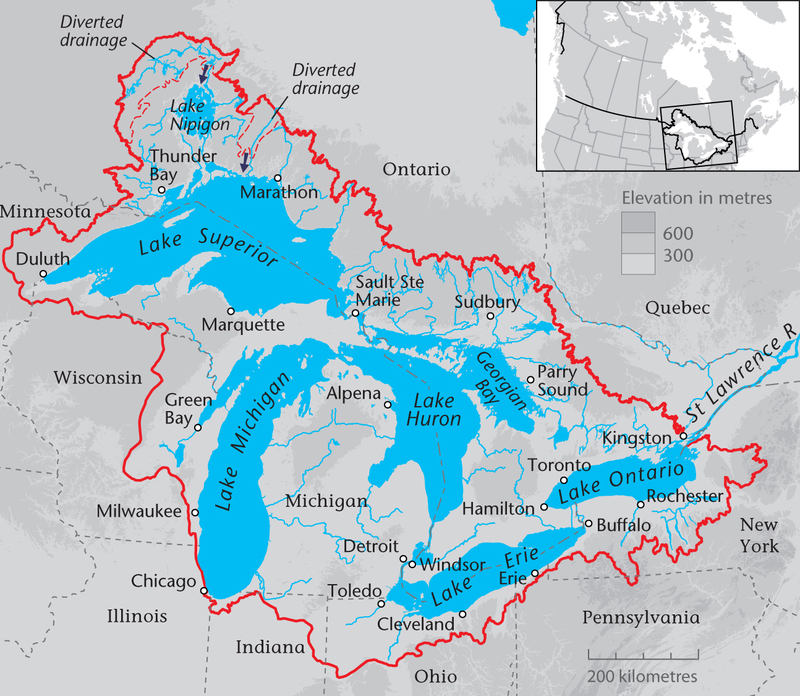 The Great Lakes and St. Lawrence River form a single hydrological system linking the interior of North America with the Atlantic Ocean. The system contains over 80% of North America’s surface freshwater, and provides habitat for over 350 species of fish and over 3,500 species of plants and animals.